America confronts a jobs crisis that has two faces. The first is obvious when we read the newspapers or talk with our friends and neighbors: there are simply not enough jobs to go around. The second jobs crisis is more subtle but no less serious: far too many jobs fall below the standard that most Americans would consider decent work. A quarter of working adults are trapped in jobs that do not provide living wages, health insurance, or much hope of upward mobility. The problem spans all races and ethnic groups and includes both native-born Americans and immigrants. But Good Jobs America provides examples from industries ranging from food services and retail to manufacturing and hospitals to demonstrate that bad jobs can be made into good ones. Paul Osterman and Beth Shulman make a rigorous argument that by enacting policies to help employers improve job quality we can create better jobs, and futures, for all workers. 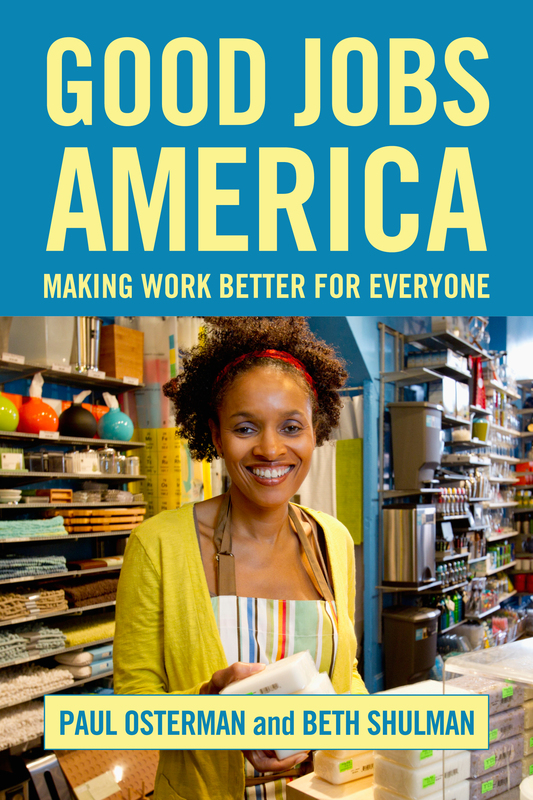 Good Jobs America dispels several myths about low-wage work and job quality. The book demonstrates that mobility out of the low-wage market is a chimera—far too many adults remain trapped in poor-quality jobs. Osterman and Shulman show that while education and training are important, policies aimed at improving earnings equality are essential to lifting workers out of poverty. The book also demolishes the myth that such policies would slow economic growth. The experiences of countries such as France, Germany, and the Netherlands, show that it is possible to mandate higher job standards while remaining competitive in international markets. Good Jobs America shows that both government and the firms that hire low-wage workers have important roles to play in improving the quality of low-wage jobs. Enforcement agencies might bolster the effectiveness of existing regulations by exerting pressure on parent companies, enabling effects to trickle down to the subsidiaries and sub-contractors where low-wage jobs are located. States like New York have already demonstrated that involving community and advocacy groups—such as immigrant rights organizations, social services agencies, and unions—in the enforcement process helps decrease workplace violations. And since better jobs reduce turnover and improve performance, career ladder programs within firms help create positions employees can aspire to. But in order for ladder programs to work, firms must also provide higher rungs—the career advancement opportunities workers need to get ahead. Low-wage employment occupies a significant share of the American labor market, but most of these jobs offer little and lead nowhere. Good Jobs America reappraises what we know about job quality and low-wage employment and makes a powerful argument for our obligation to help the most vulnerable workers. A core principle of U.S. society is that good jobs be made accessible to all. This book proposes that such a goal is possible if we are committed to realizing it. PAUL OSTERMAN is NTU Professor at the MIT Sloan School of Management as well as a member of the Department of Urban Planning at MIT. BETH SHULMAN was senior fellow at Demos, chair of the Board of the National Employment Law Project, and co-chair of the Fairness Initiative on Low-Wage Work. Good Jobs, Bad Jobs provides an insightful analysis of how and why precarious employment is gaining ground in the labor market. Paul Osterman at WashingtonPost.Com: "Raise job quality and wages to fix jobs crisis"
Op-Ed in The New York Times: "Yes, We Need Jobs. But What Kind?" NYTimes.com interviews Paul Osterman: "The Challenge of Creating Good Jobs"
Daniel Gross Talks to Paul Osterman: "Quality of Jobs Matters as Well as Quantity"
CNNMoney.com interviews Paul Osterman: "Not Getting by on Minimum Wage"